The LANCUW12 single output series offers 12 watts of output power from a package in an IC compatible 24pin DIP and SMT configuration. LANCUW12 single output series has 4:1 wide input voltage of 9-36VDC and 18-75VDC. The LANCUW12 single output series features 1600VDC of isolation, short Circuit Protection and five sided shielding. All models are particularly suited for telecommunications, industrial, mobile telecom, and test equipment applications. By Wall Industries,Inc. This is one package pinout of LANC4815UW12,If you need more pinouts please download LANC4815UW12's pdf datasheet. 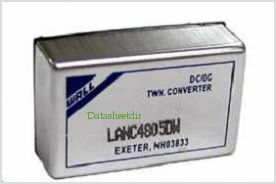 LANC4815UW12 circuits will be updated soon..., now you can download the pdf datasheet to check the circuits!